Once upon a time there was a poor widow. In front of her small cottage there were two rose trees – one of them flowered in white and the other in red. 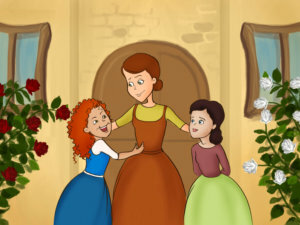 The widow had two daughters – one of them was called Snow White and the other one was called Rose Red. They were good and quiet children, singing sweetly in choirs like no other two girls in the world. 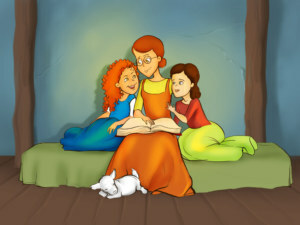 Although they were sisters Snow White was the quieter and gentler one. Their mother would add “I am the happiest mother in the world to have you two! You should promise me that you will always take care of each other and that you will share everything you have.” And the girls would promise. In the summer Rose Red would wake up early and do the housework. 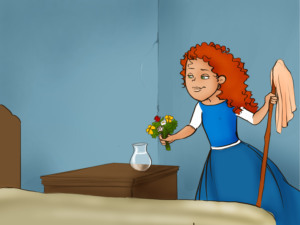 Then she would pick flowers and leave them next to their mother’s bed. Among the flowers there would always be one white and one red rose. In the winter Snow White would light the fire. 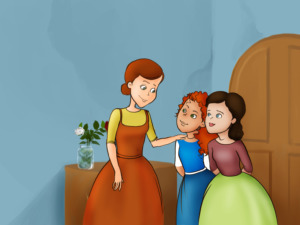 Her mother would ask Snow White to lock the door and then the girls would gather around their mother, who would put her glasses on and would open a thick book to read from it. The girls would listen and a young goat would curl up with them on the floor. One winter’s evening as they were doing just that, someone knocked on the front door. 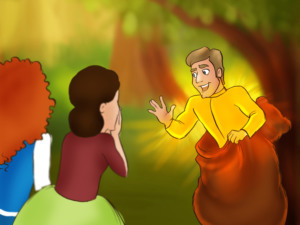 “Snow White, open the door, it looks like a stranger is in a need of a shelter,” the mother asked. Snow White, unlocked the door, thinking that it was going to be some homeless man, freezing in the cold. But it wasn’t a man! Standing there was a big bear. Snow White screamed in fright when she saw the animal. Rose Red was also scared and hid behind her mother’s skirt. The goat bleared in terror. But the bear extended his paw in greeting. “Don’t be afraid kind ladies, I won’t do you any harm, I am just really cold and I would like to warm up if you let me in,” he said. 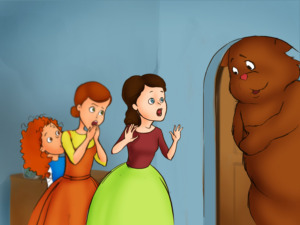 The three women looked in amazement and fear at the talking bear. Soon their mother came to her senses and told the girls to calm down and help the bear get rid of the snow he had on his coat. The girls did as their mother told them. Feeling warm from the fire the bear fell asleep and everyone went to bed. 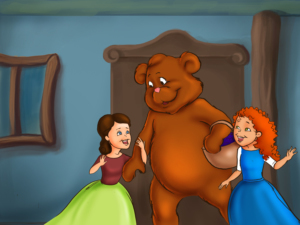 The next morning when the sun rose, the girls opened the door for the bear. He went into the woods to search for blueberries and fish, but he came back in the evening and again curled up by the fireplace. This continued through the winter and the girls were so used to playing with the bear in the evening and to have him at home that when summer came and the bear had to leave they were all very sad. 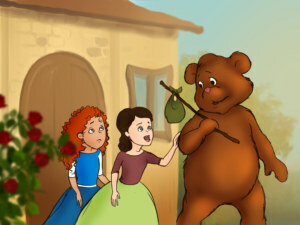 “Where are you going to go?” Snow White asked the bear. “I need to go into the woods where I keep my wealth hidden from the evil gnomes. In the winter when the earth is frozen, they cannot reach it. But in the summer when the ground softens, they dig all over in a search of treasure. 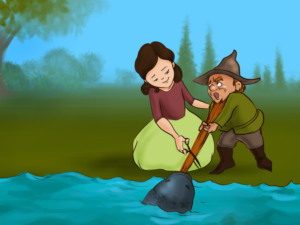 Once they get treasure they hardly ever give it back,” the bear replied. Snow White was really sad that bear was leaving. They hugged and bade each other farewell. 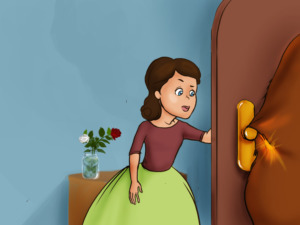 Just as the bear was leaving the house, his skin got caught on the door handle and it appeared to Snow White that gold shone under the bear’s skin, but she wasn’t sure. The bear ran out and soon Snow White lost him among the trees. 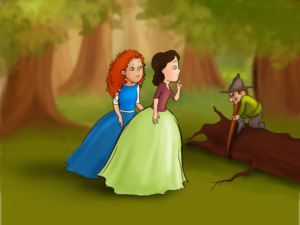 One day, the mother sent the girls into the wood to gather firewood. As they were walking they came across big tree, which had fallen down across the path. On the tree there was a little man with a long beard, which was stuck under the tree. The gnome was jumping around the crack, trying to pull out his beard, but with no success. When he saw the girls he turned his aged wrinkled face in their direction. His eyes were red and it seemed that they would soon pop out. “What are you two staring at? Can’t you come over and help?” “How did you end up like that?” asked Rose Red. “You curious thing! I was trying to gather some sticks in order to light a fire and cook a meal. Now stop asking stupid questions and quit that grinning! It’s terrible!” the dwarf snapped. 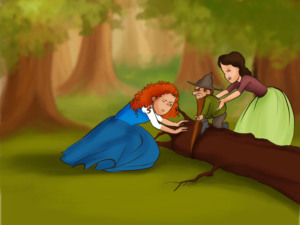 The girls tried to pull, then push, then to somehow roll the big tree, but it was too heavy for them, so they offered to go and get help. “Ha! Is that the best you could think of? Who needs more people here? You two are more than enough anyway!” the dwarf groaned. 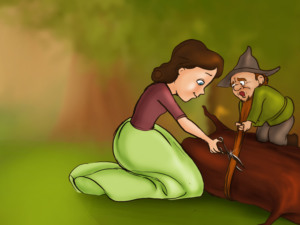 “Stay still if you want to be free again,” said Snow White and took a pair of scissors out of her pocket. She quickly cut the end of the dwarf’s beard. “What did you do, you stupid girl? How can you cut someone’s beautiful long beard?” he barked. With that he threw his bag over his shoulder and left without even looking at them. One day the girls decided to go out to the river to catch some fish for dinner. When they approached the river they noticed something which resembled a big grasshopper, jumping around the water as if it was ready to jump in it. They ran towards it and found the same dwarf trying to pull out his beard from a big fish’s mouth, but the fish was stronger. The girls grabbed him under the shoulders and tried to pull him but the fish just wouldn’t let the beard go. Snow White had no choice. She took out her scissors and cut off a small part of the dwarf’s beard. “What is that? You…frogs! How dare you bring shame on my face! My brothers will laugh at me now!" 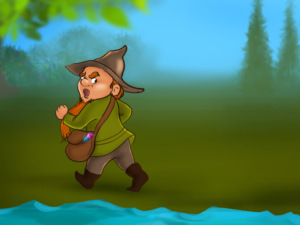 Having said that, the dwarf took his bag, which was full with gems, and left without saying a word. 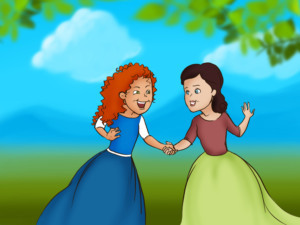 Not long afterwards, Snow White and Rose Red were on the way to the nearest town to buy some needles and thread. 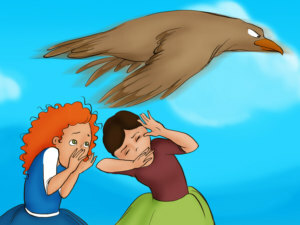 As they were passing a meadow, they noticed a huge bird in the sky. The bird was flying low and passed close over their heads. The bird perched behind a big rock and at that moment someone there squeaked. 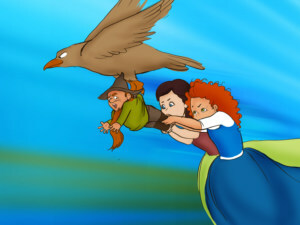 When it took off again the girls saw the same old dwarf in the bird’s claws. They ran just in time to catch the dwarf by the feet. 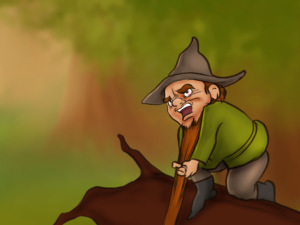 The bird pulled up and they pulled down and the dwarf was yelling in the middle, “How can you be so rude! Don’t stretch my clothes you stupid girls!” When the bird finally gave up, the gnome thudded onto the ground. The girls, who were already used to his rude manners, continued on their way to the town. “Grrrrrrrr!” they saw a bear running towards them. 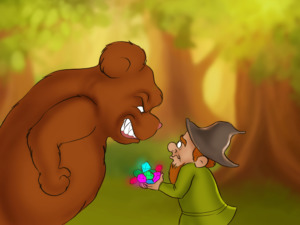 The dwarf ran towards his cave but the bear was faster than him. The dwarf was terrified. He started begging. “Please, don’t eat me! Here, take these lovely gems and spare my life! Why would you eat me? I am so little. Look at those horrible girls over there - eat them instead!” The bear wasn’t listening to him. With one swipe he knocked the dwarf over. The girls ran away but the bear followed them. “Snow White, Rose Red, don’t be afraid, stop running, I’m coming with you,” he said. 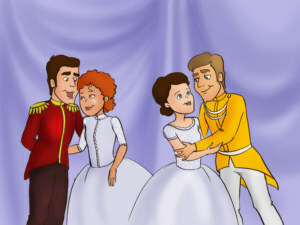 Snow White married the prince, and Rose Red – his brother. 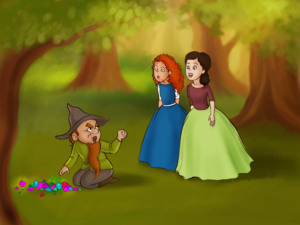 They split the dwarf’s treasure evenly and their mother moved to the castle with them. She took the rose trees with her and planted them under her window. Every year they flowered with exquisitely fragrant red and white roses.